In honor of Father's Day yesterday, Journey 2017 wanted to send a special shoutout to their dads! Joey / What's up father of mine, I hope my message is finding you in good spirits and you've broken your fast! I just wanted to let you know that I'm thinking of you our here in Africa! I've worn your sweet satchel to every single church I've been to and I've been getting handprints from so many special people. I'm trying to catch pictures of a bunch of cool stuff, emphasis on "trying." I truly miss you so much this Father's Day and I couldn't be more thankful for the way you've always pointed me to Christ. I especially remember how you'd come into my room every night to say Hail Mary. Anyways, I love you so much Dad and I can't wait to tell you all about this summer. Also I love you. Also also tell all my kin good morrow for me and offer them all loving regards on my behalf. Hayden / HEY THERE FATHER DAD. 1. I love you so much and I can't say thank you enough for everything that you have done for me but THANK YOU SO MUCH. 2. You would be proud: I was not the first person to fall into a pit latrine this time. 3. I know you had planned some awesome things for us this summer and I last second told you I was going to Africa but I promise you the outcome of this trip will be eternally beneficial. It has been so amazing to have your overwhelming support and I cannot wait to get back and tell you all about how I haven't washed my hair for two months and that I got to play soccer in East Africa. I love you so much! P.S. tell Benjamin he has another fan club in East Africa. Harrison / Hey dad! Sending love from East Africa! Things have been fun here. We are just finishing up our first round in Community 1. We have had two camps this weekend and have been doing house visits in between praying for people. It's been camping out in the dirt for two weeks without a shower! Tonight we played a game of soccer against 30 people from the community. I'm definitely out of shape! I hope things are going well at home! You have been a great dad and I wouldn't want my dad any other way. Love you dad. Anna / HAPPY FATHERS DAY!!! I wish I could spend this day with you but know I am thinking of you and sending you all of my love from East Africa! Wow how blessed am I to be your daughter. I could never tell you how much I appreciate you and all the things you do for me! I could not have made it to Africa this summer without all of your prayers and support- it means more than you could know. You are selfless, deeply caring, funny, intentional, and a man after the Lord's heart. You lead our family so well. You inspire me each day in my faith and inspire me to always pursue my dreams. Thank you for always believing in me, encouraging me, and granting me grace. You love me so well and set such an example for me. I miss you so much! Happy Father's Day I love you!! Bailey / Happy Father's Day Dad!! I hope you are getting some good time in with the boys today, I wish I could be with you all to celebrate! If Georgia weather is anything like East Africa today than it is the perfect day for a good round of golf! Instead of golf, Sunday's here are for soccer against the locals and man the girls can play well and aggressively. I miss you and look forward to getting to share with you all the Lord has been doing here. Thank you for your support in letting me be here. Thank you for all your hard work and how you provide. And thank you for how you're seeking growth - I am proud of you. I love you and hope today is a special day with Daniel and Austin and I hope they give you another big hug from me. You are valued, deeply cared for, and loved by me but man more importantly than our Heavenly Father and I hope you really feel that today. Desi / Hey Ole Man! I hope you had a great Father's Day with the new chunker and the family all together. I wish I could be there to celebrate with you guys. I hope God has been teaching you as much as He has been teaching me this summer. I can't wait to share stories when I get back. Aside from that, I want to thank you for sacrificing yourself every day for Dallas and I since before we were even born. That's something that I'll never be able to thank you enough for. A lot of kids say that there dad is their hero, but these days that statement fades away with time much too often. Thank you so much for keeping it true throughout the years and for loving me and even when I'm too stubborn to show it back. Happy (Grand)father's day. I love you! Meredith / Hey DAD! Happy Father's Day! I wish I could be there to celebrate with you! I am so blessed to have such an amazing father! You sacrifice so much and give so much love! I am proud to call you my dad! I have so many great memories of all the time we have spent together! And I am constantly thinking about all of them today! Thank you so much for being the greatest dad in the world! Tell Big Ed I said happy Father's Day as well! Know that if I was with you right now I would give you so many hugs and kisses! I miss you and the rest of the fam so much! I hope everyone's summer is going great! There is so much about Kenya I can't wait to tell y'all! Give Jack a hug for me! I love you all! Xoxo xoxo! Whit / Happy Fathers Day! It's crazy right now to not be able to call you and hear you voice but I'm so glad that I get to type this from thousands of miles away. I just wanted to tell you how thankful I am for the past 19 years of you teaching me, loving me, and praying for me. I would truly not be in Africa right now without your efforts in helping me fundraise and your faithfulness in prayer. I hope you know how much I love you and feel appreciated today! Can't wait to see you when I get back and I hope you have an amazing Fathers Day! Erin / Happy Father's Day Daddy!! I miss you so much! I'm so thankful that the Lord decided that I should be your daughter. You have been such an example of Christ in my life. You show me how to love well and show grace. Thank you for always loving me and for supporting me in following the Lord's will for my life. One of my favorite memories of you is getting up in the morning and seeing you sitting in your chair reading your bible and praying. You have always been an example of how to live out my faith. Thank you for teaching me how to own my faith and how to be bold and share it with others. Thank you for teaching me the importance of working hard and working with a good attitude. You have taught me so much more than I could say in this short post but just know I am so thankful for all of those lessons. I love you so very much daddy! I can't wait to hug you big when I get home! Madeline / Wow, today is Father's Day and I am missing you like CRAZY. I sending my love all the way from East Africa and can not wait to see you in 6 short weeks! Today, and everyday, I am thankful for the lessons you have taught me. You have taught me how to be a servant leader, how to be humble yet bold, and you have shown me what hard work truly looks like. From Minnesota, to Texas, to Florida, to Kansas you have always managed to make a house feel truly like a home. I wish I was there to celebrate with you, and remind you how loved and appreciated you are. I am forever thankful for you and there is no better honor than having you for a father. I love you bunches and happy Father's Day!!! Hey Dad! I'm not sure what you're plans are today but I hope you're enjoying some good rest and or TV time. I wish I was there to tell you in person and take you out to McDonald's for lunch but that time will come in August. Im praying for you daily and I'm so excited to get back so I can share with you what God has been teaching me. You deserve a great day, Daddy. I love you more. Jack / Hey Dad, happy Father's Day! Really wish I'm there to tell you in person. I'll be praying for you today as you preach and hopefully get up to the mountains in your Jeep. You've been there for me in the good seasons and you've been in my corner during the bad ones and I thank Jesus everyday for that gift. You're such a huge blessing to me and I'm thankful that you're my Dad. You're faithfulness in sharing the gospel is one of the huge reasons for my calling. You're a servant leader with a heart for the Lord and I'm so so proud to be your son. Love and miss you. Caroline / Happy Fathers Day Dad! Wishing I could be there to celebrate you today, but know I'm covering you in prayer from East Africa! I'm thankful for the father you are to our family-you provide for us and lead us well. Our family would not be the same without you and I would not be where I am today without you! Thank you for being our best example, supporter and encourager. Hope you have a great day celebrating, miss & love you! Growing up, I was never a huge fan of summer camps. The idea of doing crazy outdoor adventures with strangers never really fired me up. When I was told the journey team would be training at a place called Camp Highland, I was a little apprehensive about what this training would be like. I didn’t think a week at a summer camp would be necessary for a mission trip to East Africa, but boy was I wrong. It has only been one week in the Journey adventure and I have already learned so much. I learned that through weakness and fear, God makes us strong. If you know me, you would know that ropes courses and rock walls are just not my thing. At all. On Friday we made our way over to the ropes course and I was terrified. The ropes course at Camp Highland is probably seventy feet tall, or at least it felt that way. While I was strapping on that harness and helmet, I just kept thinking to myself, “Meredith, RUN! Run into the woods and maybe no one will notice that you’re missing.” In order to successfully complete the ropes course, you need a partner. I was paired with Hailey Lombardi and I was so nervous she would be frustrated with the fact that I was so scared. Luckily, I was wrong. She was so encouraging and positive through out the whole situation that I knew I could trust her to get me through that entire death trap they call a ropes course. Her encouragement and the encouragement from the rest of the Journey team really helped me find strength through the Lord, and by the grace of God I was able to complete that ropes course with out peeing my pants from fear. I learned a lot about trust this past week. I learned how to trust my team, trust in myself, and more importantly trust in God. The CTI staff went into a lot of planning for the past week, to where the interns would just have to trust in them and surrender control. Surrendering that control and just having blind faith in my team and the staff was very hard for me. I don’t give trust to just any body, but the Lord had a different plan for me. The different activities and teachings really opened my mind and heart to trusting the CTI staff and interns. I think it’s safe to say all the interns were vulnerable and open. This enabled us to lean into one another this past week. Putting trust in each other is such an important factor in our trip to East Africa. With out it, we would probably all go crazy and want to kill each other. I know this is such a cliche, but I would not change a single aspect of what happened this past week at training. Last Sunday, Nathanael said we are now part of the Journey family, and I felt that this week. We grew closer as a team and I know we will face this summer as a family. It is so crazy to think that a week ago we were all strangers at one point. I walked into the welcome party not knowing any body and now I feel so close to every one on the team. It is amazing that we all feel this close from just one week; I can’t imagine how close we will be at the end of the summer. Camp Highland was such a blessing. With out that week of crazy outdoor adventures with complete strangers, I don’t think we would have been ready for a summer in East Africa. I know we will all face ups and downs this summer, but I am confident that we can over come it all, with the trust we have in each other and more importantly in God. One verse I really clung to this past week was Isaiah 12:2 “Behold, God is my salvation; I will trust, and will not be afraid; for the Lord God is my strength and my song and he has become my salvation.” With the power of trust, God will give all of us strength this summer. If we all surrender completely to the Lord this summer, we will be unstoppable. I am so excited to see what God has planned. He will do great things in East Africa and I can’t wait to see it all unfold this summer. As we prepared for our year end giving initiative this year, one of our needs for the next season of ministry included a CTI vehicle for traveling to and from the rural communities in East Africa. An all terrain vehicle will help us frequently travel further miles + reach more people with the gospel in the most remote places of the 11 rural Kenyan communities, where many are being discipled through Rejoice Project. And so, we are trusting the Lord for the provision of $35,000 to make a way for us to GO! We believe it's worth it so that Christ may be invited in + more may experience His inexhaustible fullness of LIFE! What if we all came TOGETHER on this day to experience the JOY that comes through giving? We are humbled and privileged to GO TOGETHER as part of His people, His Church, and His Kingdom. We are also thankful and blessed that God leads us to invite others into the story He is telling through this ministry. It is our highest hope that He is honored and glorified in all that we do. And that by your generous response, you too, will experience how wide, how long, how high, and how deep His love is! Will you embrace the journey with us? You're invited! To give today, go here. We are thankful for the time we had with Alison this summer as a member of our Journey team. We are even more thankful that she has chosen to come back and deepen the relationships God allowed her to forge in East Africa. Our friends tell us just how meaningful it is when people choose to return, to invest deeper and longer than just a one-trip experience. God doesn't ask everyone to return, but when He does, it sure is a sweet thing to be a part of as He builds His people, His Church, and His Kingdom through fellowship and discipleship! Thanks for investing again with us Alison! When I walked into Journey this summer I had no idea what I was getting myself into. I was entering into an internship with an organization that I found on google and everyone around me were strangers. When my parents dropped me off I was devastated, going to Africa had always been my dream, but at this point I just wanted to go home. When my parents left me at the Avery’s I thought the summer was going to be rough. As Journey began, first with Camp Highland and then with traveling to East Africa, it started to sink in that this was not going to be the worst summer I had ever experienced. Journey, for me, was 3 months of truly learning who God was. He revealed himself to me in ways that I never thought possible. Through the word, worship, conversations with Peter (A Rejoice Project Coordinator) and all of the Rejoice Project leaders, God showed me who he is and that he is so much better and so much more than I could ever imagine. He used a team of complete strangers to show me how much he loved me and he used a group of beautiful East Africans to show me that there is so much beyond my city in the United States. Approximately three weeks after arriving in East Africa I began to feel the Lord really tug on my heart and tell me that Journey was not the end for me. In our second community I began really connecting with the East Africans and feeling a pain in my heart at just the thought of leaving. Four weeks into my 10 week summer I started praying about continuing work with Choose to Invest after I graduated in December. Just a few days after Journey ended, I was home and applying for Spring Internship. East Africa had my heart, the Rejoice Project coordinators, leaders, and kids, had my heart and I was about to transition into a season with nothing planned. By this point, I knew that God was calling me back. Part of the reason that I fell so in love with what Choose to Invest is doing in East Africa and in Haiti is because they have managed to connect everything that I am passionate about. They are currently working in the two countries that I love the most in this world, they are spreading the beautiful name of Jesus, and they are preventing human trafficking and preventing orphans. With graduation coming up in a short month, I can’t imagine doing anything besides going back to East Africa and helping to invest in the lives of people I love so dearly. The Lord has burdened my heart for this organization and the people that they are reaching and I could not be more grateful to have the opportunity to continue working with them this spring! We have sat looking at a blank screen for far too long trying to come up with words to describe what Journey has meant to us and how God has used this experience to transform our lives. How could we ever describe it? Now that we are 5 and 6 years past our Journey Internship, we think the clearest way we can describe it is a launching pad. Journey was our launching pad into a life of surrender and service and joy and grace. It was through this internship that God taught us to walk. He taught us how to seek Truth and wrestle with it and live it out. He taught us how to be real, how to confess, how to live in very genuine community. We learned about our wiring and how God has creatively and uniquely designed us to build his kingdom on the earth. We learned we are loved, chosen, redeemed, and that God has called us to pour our lives out in the very same way He did. So since Journey 2010 and 2011, we’ve been trying to do just that—pour our lives out as Jesus did. We got married in 2014 and moved to New Hampshire to serve the church in New England. Tommy was a Campus Pastor leading local and global initiatives and Amy was a Children’s Pastor serving birth-5th grade. In January of 2016 we joined the staff at Eastview Christian Church in Normal, IL. Tommy is the Global Outreach Pastor facilitating relationships between the local church and global partners in India, Haiti, Kenya, and North Africa. 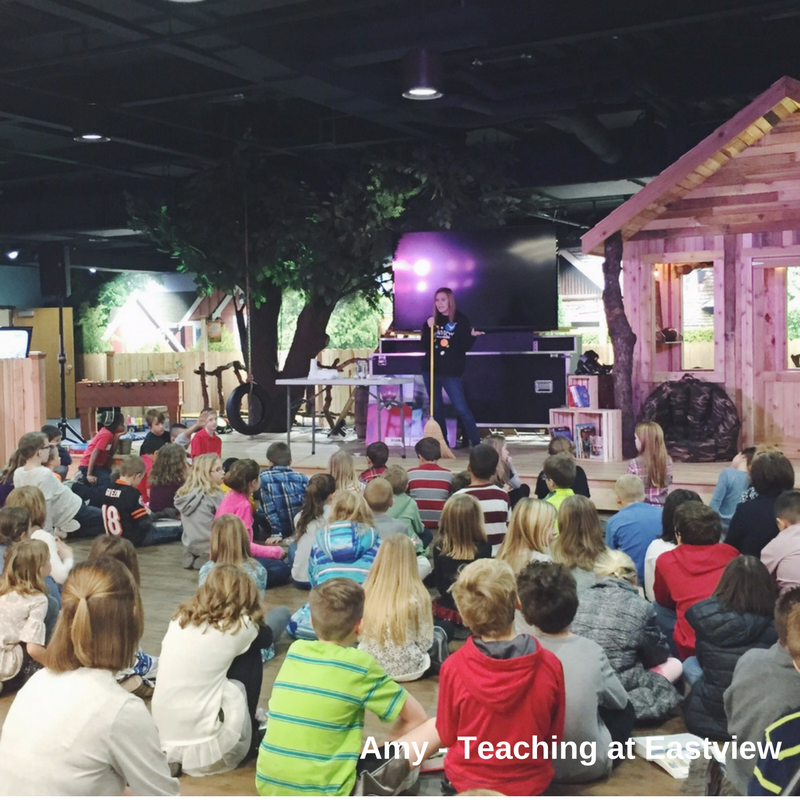 Amy is the Pastor of 2nd/3rd Grade. Journey has been our launching pad. It has launched us to places both physically and spiritually we could have never anticipated. We are forever grateful. Please holler at us if you want to connect!